You are here: Home › Buying guide › How old is it? Many Aprilia Futuras spent a long time hanging around on showroom floors waiting to be sold. Some spent years being shifted from dealer to dealer – even country to country in an effort to find buyers. There may even still be new Futuras gathering dust in warehouses still. Several owners bought what they thought was a new bike in 2003 only to discover it was two years old. For owners of US models this is pretty simple as they have a plate showing build year and month. It’s not that easy for the rest of us. So how do you find out when your Futura was built? The answer is under the seat. Lift the seat and you’ll see the spare parts ID sticker next to the battery. This will tell you year of build and the country it was originally intended for. It shows build year (between 01 and 03, despite what anyone says) and the country the bike was intended for (this one’s a German import). If the punch is anywhere other than the UK mark, it’s a parallel. Later models have only EU, UK or US (+ California) model designations. Of course the other way is the frame number. It’s daunting at first, but actually pretty simple to decode. The first part are manufacturer codes and model codes, and are the same on all Futuras. The last six digits relate to the individual bike in this case 000001 – the first production Futura. 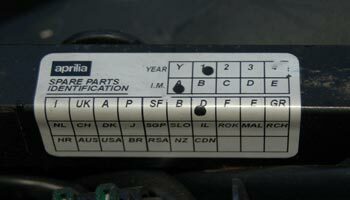 One back from this is the factory code, in this case S, for Aprilia’s main production facility at Scorze, and one digit back from that is the year of production code – in this case it’s a 1 for 2001. Futuras have either a 1, 2 or 3 in this part of the frame number.